Newtec heads to Africa where their technology will be used by satellite operator NIGCOMSAT as it expands its enterprise, government and consumer Ka-band broadband services in Nigeria. NIGCOMSAT, which was founded in 2006 by the Nigerian Federal Ministry of Communication Technology, will now deploy a second hub and thousands of Newtec's MDM2210 IP Satellite Modems and MDM2510 IP Satellite Modems after the continued success with Newtec’s VSAT platform Newtec Dialog®. Abimbola Alale, Managing Director and Chief Executive of NIGCOMSAT said that the ability to run multiple services over Newtec Dialog, was a key advantage for them when selecting their technology partner for this expansion as it means they can install a variety of modems and select the best one depending on the application being addressed — and all via a single platform. Along with the optimal efficiency achieved via Newtec’s in-built technologies, this will allow them to quickly and cost-effectively expand their portfolio to meet the rising demand they are currently seeing across Nigeria. Newtec’s long-term certified business partner, Content Oasis Ltd., will be a system integrator, maintaining the Newtec Dialog platform and the modems installed for NIGCOMSAT. 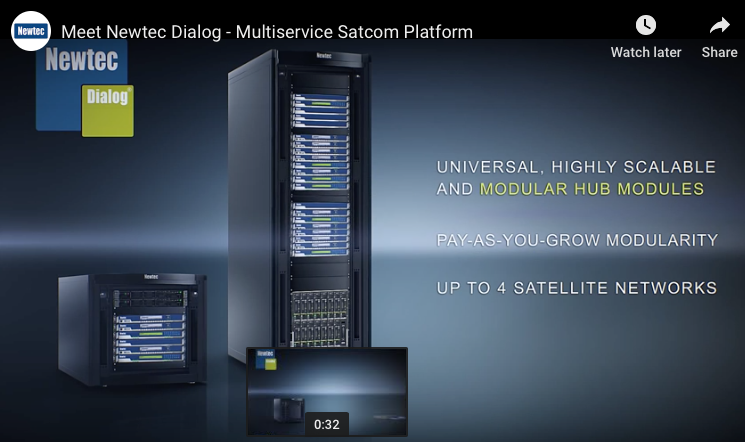 As a multiservice VSAT platform, Newtec Dialog enables operators to build and adapt satellite networking infrastructures according to specific needs. With Newtec’s modems, a choice of three return technologies is provided, including MF-TDMA, SCPC and Newtec’s unique, dynamic Mxâ€‘DMA® which combines qualities of both to provide efficient bandwidth allocation. Thomas Van den Driessche, CEO at Newtec said that as NIGCOMSAT looks to expand its offering, Newtec Dialog offers a perfect fit for this, allowing NIGCOMSAT to seamlessly move into new markets. Newtec is pleased to be able to expand their long-term partnership with NIGCOMSAT at what promises to be an exciting time for the company and have every confidence that their technology will meet the needs of both the company and its customers. Newtec will be at AfricaCom, Cape Town, South Africa, in booth F9.